Median sales price is a very general statistic, often concealing an enormous variety of values in the underlying individual sales. It can be and often is affected by other factors besides changes in fair market value, such as changes in the inventory available to purchase, and major changes in the distressed property, luxury home, or new home construction segments. 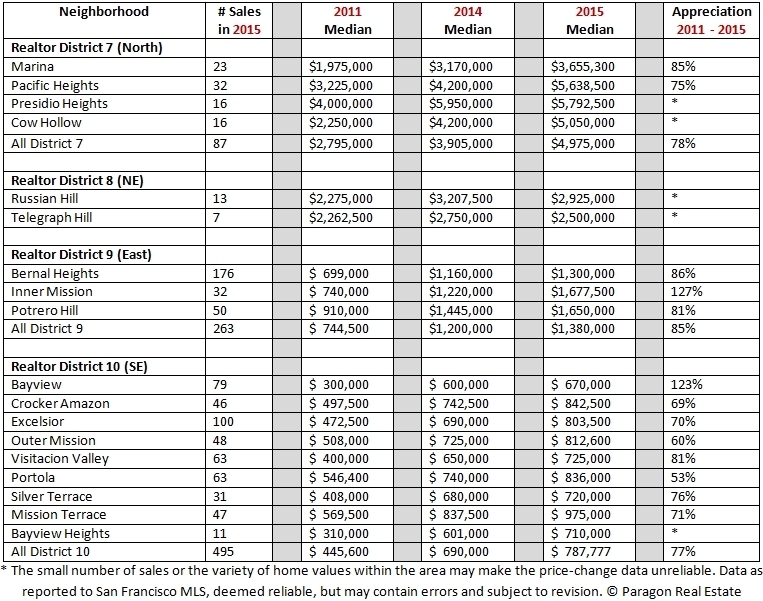 Sometimes median prices fluctuate without any great significance: substantially different groups of homes (larger, smaller, older, newer, etc.) simply sold in different periods. Assessing appreciation by changes in dollar per square foot values, instead of by median sales prices, can sometimes deliver significantly different appreciation rates. 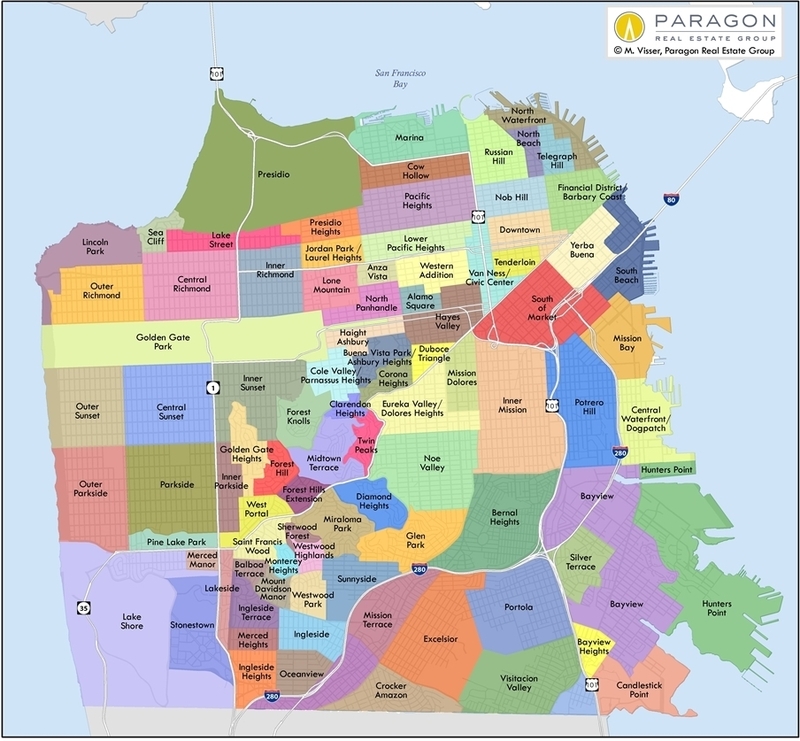 Below the charts is a table with a more comprehensive list of San Francisco neighborhoods, and at the bottom of the page is a neighborhood map. 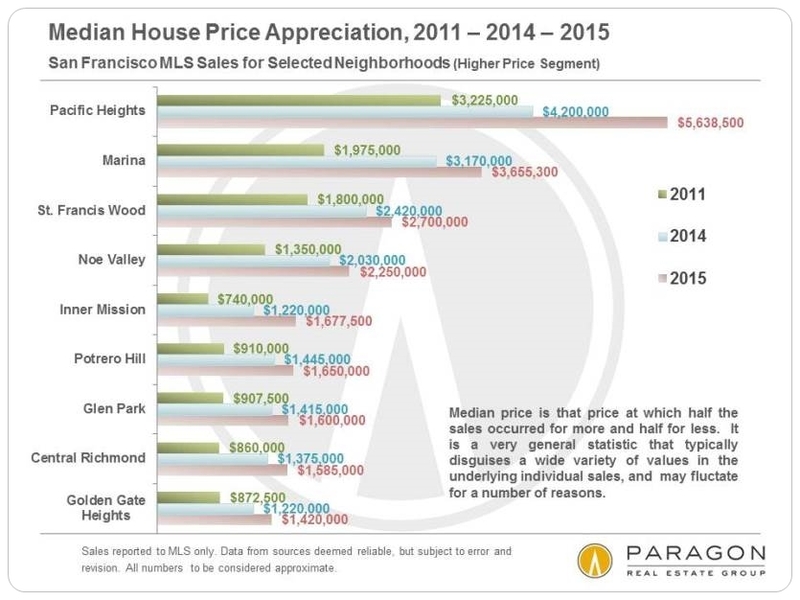 The neighborhoods on the table below are grouped by San Francisco Realtor District, some of which contain neighborhoods of relatively similar values and some with highly variable home values. 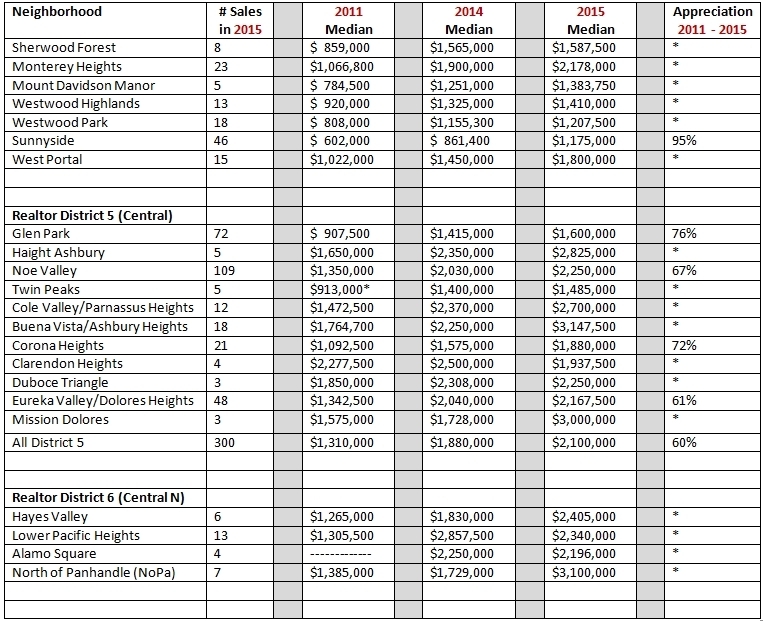 Generally speaking, the higher the number of sales, the more reliable the statistics: We’ve usually calculated appreciation rates for neighborhoods with at least 24 sales in 2015, but these should still be considered very approximate. An asterisk signifies a very low a number of annual sales and/or our suspicion that the appreciation calculation would not reflect market reality due to the variety of issues pertaining in the area. 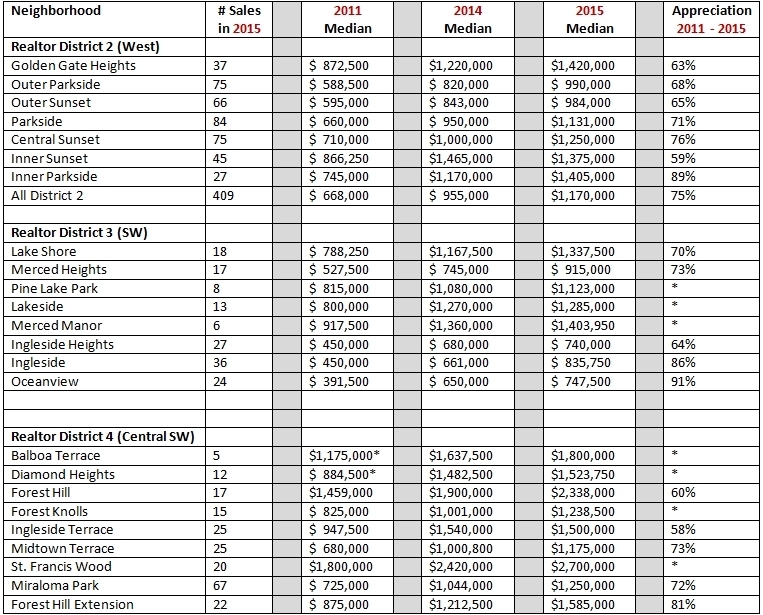 In 2011, median sales prices in some areas, especially in the southern border neighborhoods of the city, were badly distorted by distressed property sales (bank and short sales) that didn’t represent fair market values. 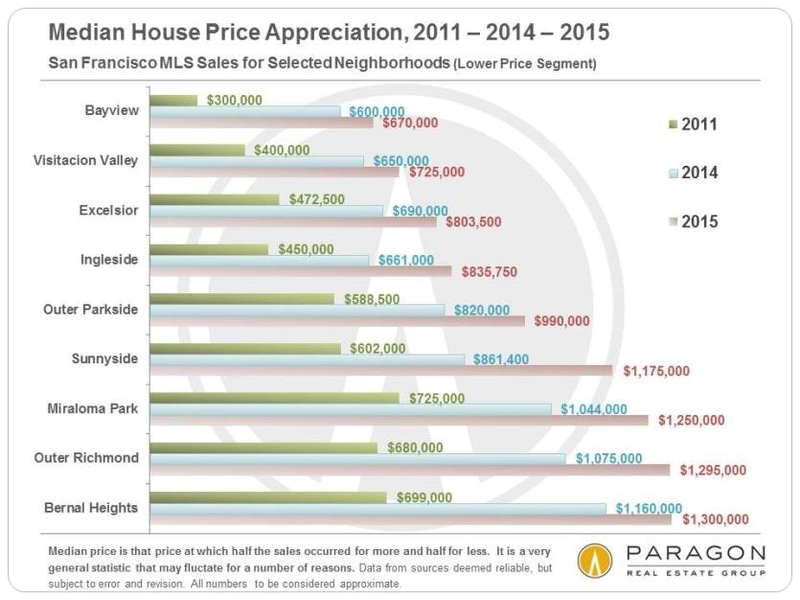 If this situation applies, the 4-year appreciation rate will jump higher in that neighborhood. These analyses were performed in good faith with data derived from sources deemed reliable, but they may contain errors and are subject to revision. All numbers should be considered approximate.